You are here: Home / Dr Stephen Doyne-Tax Fraud? 1. On Friday, June 24, 2011, the Appeal Court granted the order for Dr Tadros to pay Stephen Doyne attroney fees of $86,135.95. To date, however, not a single discovery of Doyne’s credentials was ever allowed. 2. Next business day, Monday, June 27, Dr Tadros complied with the court order in full with the check below, yet not a single discovery by the Appeal Court has occurred. In an accompanying letter to Mr. Doyne, he informed him with what appears to be criminal activity committed by Stephen Doyne on the US Government. 3. On June 30, 2011, within a matter of hours of Stephen Doyne’s acknowledgement of what appears to be criminal activity by him, Doyne rushed to release a press release claiming the court ‘cleared’ him of all allegations in the case at bar, which is at this point in the Appeal Court. 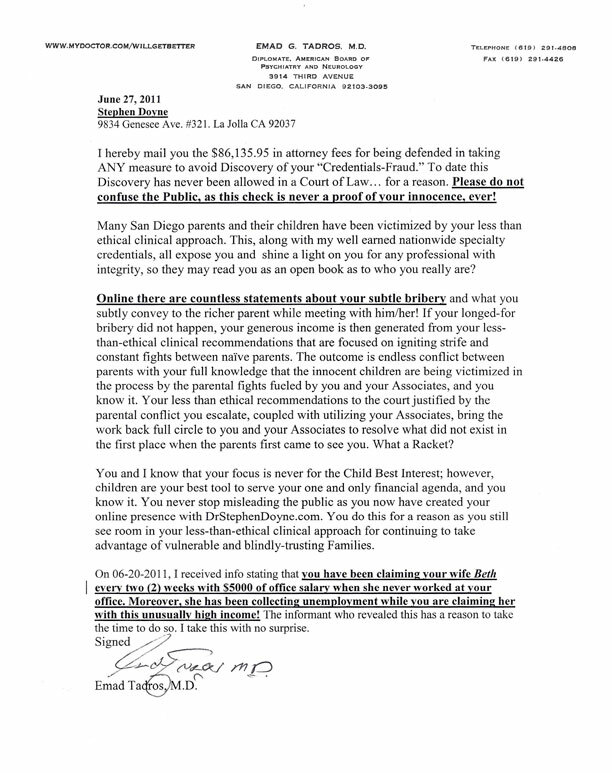 ***Voice message left on Dr. Tadros’ answering machine in June 2011 by Jan who worked as Stephen Doyne’s office manager. Interest on the ordered amount? There’s nothing in the court order that interest must be paid! 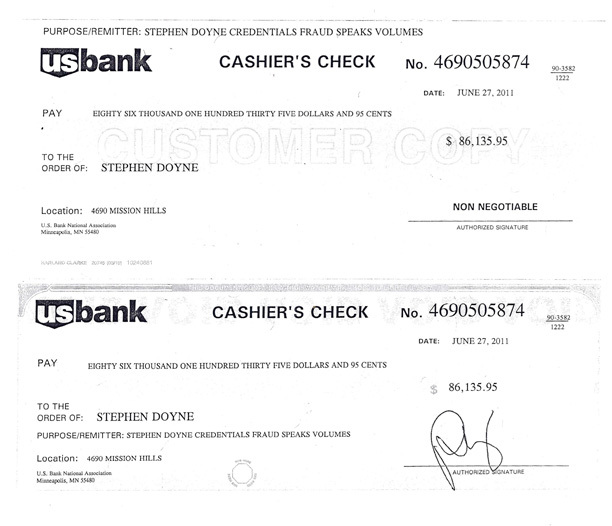 How Stephen Doyne thinks he is owed interest on this amount defies all ethics, morality, and financial logic. Clearly, Dr Tadros complied with the court order and promptly so. This is only a confirmation that Doyne is only less-than-ethical.